In America, when I see a couple of guys walking down the street holding hands, it makes me happy. I am a big believer in love, and believe telling people who they can or can’t love is morally wrong. I vote for gay-friendly candidates, and I shout with glee every time a Federal judge rules that gay people are human beings deserving of equal rights under the law. 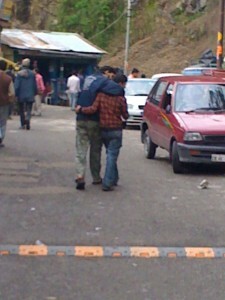 So why the hell does the Man Love in India freak me out? Man Love is everywhere. Men hold hands, sit on each others’ laps, hug, cuddle, and slap one another’s behinds with no timidity or trepidation. Now this is not shocking, or scary, to my eyes, it is just a little… odd. What does it mean that me reaction in India is surprise, when the same behavior in America makes me feel happy and safe, a reminder that the US is a free country? Mostly, it is because I am weird and think too much. Partly, it is because there is an inverse ratio thing going on. It seems the more conservative the country, the less worry about appearances. Homosexuality is so taboo here, gay men so in the closet, that straight men can be affectionate with each other in public without the risk of being thought “gay.” So the constant cuddling is almost a reminder of anti-gay sentiments. I thought that this was a guy thing only, but Merideth tells me that woman do the same thing, I have just apparently not noticed. Partly, it is my own American mindset, getting in the way as usual. I love my male friends. Would fight for them, kill for them, narrowly avoid death for them. But I would not hold their hands in public. Not because I am worried about what people think. I could care less if someone thought me gay. But it would never even enter my mind. Sitting on my guy friends’ laps is just not something I would ever consider, so it is bizarre to see it happen so often here. And then is the very remote, but still possible, event that I would one day be expected to hold hands with a dude. I am not sure if I could do it. And why not? People have thought me gay before (people that did not know gay people, but still), and it did not bother me. I love my male friends, and I am quick to tell them I love them, and am always good for a bear hug. But holding hands? Awkward. So I catch glimpses of the Man Love, and a lot of conflicting emotions bubble up. It brings up prejudices I have long fought to overcome, confusion about how to tell someone I love them, and questions about my own view of friendships. Not something I want to deal with when I am wandering down the bazaar craving a samosa. Like so many other things, this is just another reminder that I am in a very different place. You expect the language and the architecture and the landscape to be different, but I am not over being surprised at the little things, the things you never thought about and never expected to be different. I don’t think Man Love is an option for me. Just one more cultural artifact from Texas I carry with me through India and life. I laughed so hard when I read this. I know how pro-gay-lesbian you are. Could it possibly be that these Man-Love people are really gay but, assume people will not think so because gay is so unacceptable? Sort of a psychological twist on their “outing”. I’m not gay so, I can act gay because secretly I am!